Luminescent minimalism at its finest, Philips' LED ceiling does away with the lampshades of old and ushers in a new age of dazzling décor. 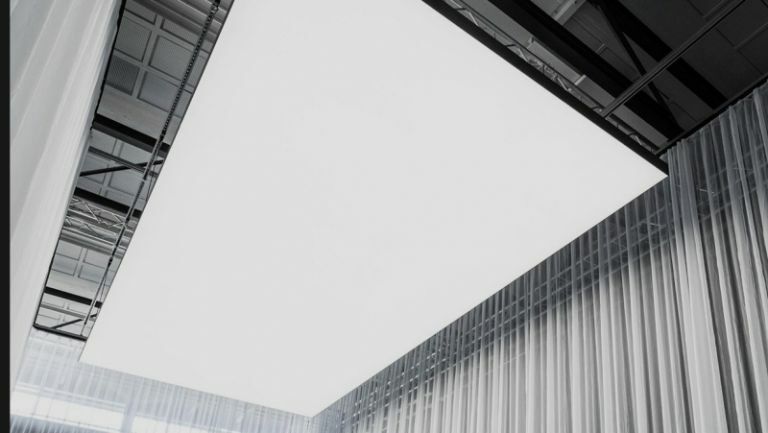 The aim of the OneSpace ceiling is to emulate natural light, tucking away LED's behind a glass fibre panel to create a single seamless light-source. "We see the architecturally-driven trend to de-clutter the ceiling. With OneSpace we are enabling architects to make a design statement," says Antoon Martens, of Philips Lighting. The OneSpace can be suspended from the ceiling, or even incorporated at design level, meaning the light would form an integral part of the structure. Apple's Jony Ive is likely overcome with post-modernist pleasure at thought of the OneSpace, a product Philips says is likely to be used in showrooms and retail spaces rather than in consumer's homes. Not their first foray into interior design, Philips showcased their LED carpet late last year. The company is also expanding it's Hue range of connected home lighting products. The carpet used transmissive light technology to display text and images, again targeting retailers rather than the public. Head to the comments and let us know whether you think the OneSpace is a design dud or a resplendent retail revolution.